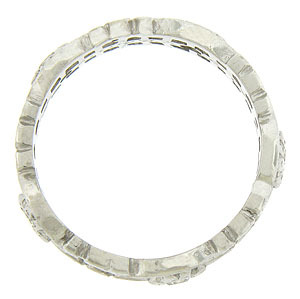 A layer of bold filigree accented with a delicate diamond floral ribbon, forms this elegant wedding band. Scrolling cutwork frames the lovely floral band. Inscribed "To J.A.F. from W.R.G. 6-17-45". 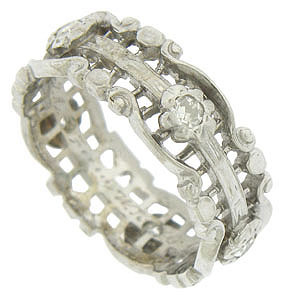 The vintage wedding ring is fashioned of 14K white gold and measures 7.16 mm in width. Circa: 1945. Size 7 3/4. We cannot re-size.